Herpes zoster ophthalmicus or ocular shingles is a vesicular rash on the face (usually on one side only) caused by the herpes zoster virus, the same virus that causes chicken pox. Reactivations and recurrences can be triggered by stress, fever or general unwellness. After recovery from chicken pox, the virus remains silent within some nerve ganglions. When it reactivates, the virus travels along the nerve to the skin and causes the painful rash typically known as shingles. If the virus resides in the ophthalmic branch of the trigeminal nerve, then reactivation will cause a rash on the face - this is known as herpes zoster ophthalmicus. Please note that ocular shingles is NOT a sexually transmitted disease. WHAT ARE THE MANIFESTATIONS OF OCULAR SHINGLES? The herpes zoster virus, like the herpes simplex virus can affect any part of the eye, from the front (eyelids) all the way to the back (retina). Generally, the further back the virus has infected, the worse the disease is. 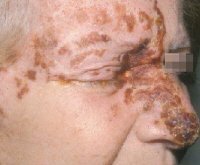 Shingles: The rash is the main feature of herpes zoster ophthalmicus. Initially, you may only have sharp pain and increased sensitivity of the skin over the forehead and scalp but no skin rash. After several days, the vesicular rash will start to appear (see left). The rash tends to affect the scalp, forehead, upper lid, and sometimes one side of the nose. As long as the rash is still wet, it remains contagious as virus is still shed from it. The virus spreads both by inhalation and contact. During this time, you should stay away from non-immunized children and adults, pregnant women and patients with low immune system (immune-compromised patients). Once the rash has crusted and dried, the disease is no longer contagious. It can take a few weeks for the rash to completely resolve. Herpes zoster conjunctivitis: This is common with ocular shingles. The conjunctiva (thin layer over the white of the eye) becomes red and injected, occasionally with some small bleeding areas (see right). It tends to resolve within a couple of weeks without any serious damage to the eye. However, a bacterial infection may occur on top of this, and thus antibiotic treatment is sometimes required. Corneal involvement: The cornea (the clear window of the eye) can be affected in various ways. Viral replication in the corneal epithelium (outermost layer of the cornea) can cause the eye to feel irritated from epithelial keratitis. Stromal keratitis (see left; white arrows) occurs 30% of the time, and can cause the cornea to become scarred and thinned. If there is destruction of the nerve to the cornea, neurotrophic keratopathy develops and this leads to reduced corneal sensation, decreased production of tears, and delayed corneal healing. Corneal involvement occurs in up to 65% of ocular shingles, and is more likely if the rash also affects the tip of the nose. All the corneal problems associated with the herpes zoster virus have the potential to cause corneal blindness and so must always be taken seriously. Corneal involvement can occur and persist even after the rash has resolved. Herpes zoster uveitis: Uveitis occurs when the zoster virus causes inflammation in the eyeball. It is also more common if the rash also affects the tip of the nose. If prolonged and untreated, the inflammation can cause atrophy of the iris tissue, pupil irregularity, cataract, and glaucoma. As with corneal involvement, uveitis can occur and persist even after the rash has resolved. Acute retinal necrosis: The retina is the light-sensitive innermost lining of the eyeball, which detects, absorbs and processes the light that enters the eye. In severe ocular shingles, the retinal tissue can become inflamed and necrosed. This is uncommon, and tends to happen more in people who already have a depressed immune system, such as HIV patients or transplant patients who are on strong anti-rejection medications. 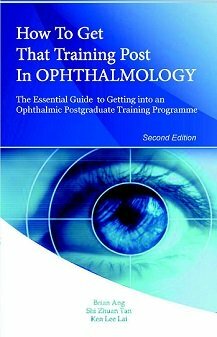 This can progress to retinal detachment and the outcome is generally poor. HOW CAN HERPES ZOSTER OPHTHALMICUS BE DIAGNOSED? The hallmark of herpes zoster ophthalmicus is the characteristic rash on the scalp and forehead on one side only; this rash does not cross the midline to affect the other side. Your ophthalmologist will need to check your eye pressure and also make sure the cornea and retina are not affected by the infection. The definitive way to detect the herpes zoster virus is by taking a sample from the eye or the rash for analysis with polymerase chain reaction (PCR). If the herpes zoster virus DNA is detected, then the diagnosis is confirmed. The sample can be from the skin rash (skin swab), conjunctiva (conjunctival swab), the anterior chamber (aqueous tap), and the vitreous cavity (vitreous tap). HOW CAN HERPES ZOSTER OPHTHALMICUS BE TREATED? Mild ocular shingles can resolve spontaneously over several weeks without any treatment. However, if there is corneal involvement or uveitis, it is generally a good idea to start treatment to reduce the risk of visual loss. Anti-viral treatment: This is the mainstay of therapy, and is in the form of antiviral tablets (aciclovir, famciclovir, or valaciclovir), usually taken over the course of one week. Antiviral tablets are only effective if started within 72 hours of the symptoms occurring. Once the 72 hours have passed, there is little benefit in starting the antiviral tablets because the they will no longer improve the outcome of the disease. However, in very severe disease, such as in acute retinal necrosis, you will need to be admitted as an inpatient in the hospital so that antiviral medication can be given directly into the bloodstream (intravenous administration), regardless of the duration of symptoms. Steroid eye drops: Steroid eye drops are beneficial if there is stromal keratitis or uveitis. Steroids will help to settle any inflammation in the cornea or the anterior chamber, thus promoting recovery. If you have been put on steroid eye drops, your ophthalmologist will need to monitor your eyes closely to make sure you do not run into any steroid-related complications, such as increased eye pressure and secondary eye infection. Pain relief: Once the infection resolves, you may still experience occasional intense sharp, electrical-type pain over the same area. This pain is known as post-herpetic neuralgia and is more likely to occur in elderly patients. It is due to irritation of the affected nerves, and because of this, the usual painkillers such as aspirin, paracetamol and anti-inflammatories, tend to have limited effect. To relieve post-herpetic neuralgia, you will need to take medications that reduce irritation of the nerves, such as gabapentin and amitriptyline.